“ROI” can be a blurry idea in the world of content marketing. With often hard-to-measure costs and returns, content marketing ROI or value isn’t always crystal clear. Dealing in metrics like pageviews, time-on-page, organic impressions, and others aren’t always directly translatable into business revenue, which — let’s face it — is what your bosses really care about. But how can you prove it with evidence that your chief marketing officer (CMO) or content director actually cares about? Content is the foundation of everything we do here at TopRank Marketing. And our clients deserve and expect us to be able to connect our content marketing services to tangible business benefits. In just three easy steps, we can help you make that same connection and prove the value of your content marketing up the ladder. As a marketer, you’re no doubt aware that you need to set a measurable goal before launching campaigns, but just because you know you should, doesn’t mean it always happens. 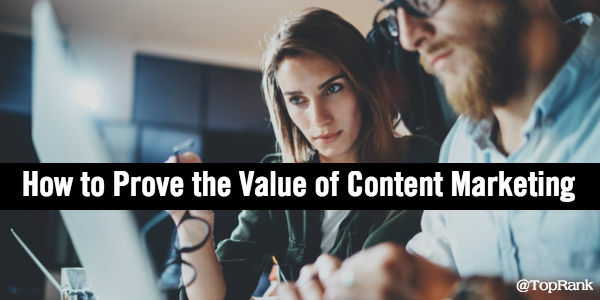 Without setting a measurable goal, one could argue that your content marketing didn’t accomplish anything of real business value. To set your goals, take a look at the current state of things to understand opportunities and what’s working well. Is there a dip in organic traffic that you hope to recover? Do you aim to increase conversions and marketing qualified leads (MQLs)? If you’re not sure where to start, review your current website performance in Google Analytics or in Google Search Console to identify potential KPIs. So, even if you’re driving results that aren’t directly tied to your goals, there might be a different marketing success lying in a related KPI that can help you sell value up the food chain. Once you have your goals and KPIs locked down, you can now measure your content’s performance against them in real-time. You know you need to measure content performance so you can see how you’re progressing towards your objectives. But how can you do it more effectively and efficiently? Depending on your goals, there are usually three areas of focus you’ll want to measure: awareness, engagement, and conversions. Or in other words, the top, middle, and bottom of the funnel. For measuring your brand awareness, you’ll need to track social shares, impressions, mentions, and overall website traffic from first-time visitors. For our own campaigns, we like using tools like BuzzSumo to see the traction our content is getting on social media. Another component to awareness, is search visibility. To see if you’re gaining more organic impressions, rankings, or clicks, log into Google Search Console. It’ll take some digging to see the new keywords you may be ranking for and to identify new positions, but it’s worth the extra work to see how your content is impacting your organic traffic. If you’re looking to develop your connection with your audience, improve trust and retention, or promote your thought leadership, you’ll want to track your audience’s engagement with your content. Engagement metrics to measure are time on page, blog pageviews, bounce rates, pages visited per session, or number of return visitors. Often referred to as “vanity metrics,” this data can still provide you with valuable insight when looking at the numbers in the context of content. For example, an average session duration of 10 minutes overall is nice to have, but it doesn’t tell you anything about why people stayed so long. By looking at the average session duration for individual webpages, however, you can start to identify common characteristics that people stick around for. You can drill down on these metrics for each webpage in your Google Analytics account in the “Site Content” section of the “Behavior” menu, as pictured below. Conversions are all about content marketing results that have the power to drive revenue. This means form fills, conversions, MQLs, or a growing subscription base. To track most of these items, you’ll want to have your website set up with conversion or event tracking. We like using Google Tag Manager to identify and track these events as they happen. Then, to really see how our content impacts conversions, we’ll also see how many form fills or conversions happened after interacting with a piece of content. After you’ve identified your metrics and how to track them, take a look at the data as is to set your benchmarks for each metric. Going forward on a monthly basis, make sure to document or export the data you’re seeing to see if you’re meeting or exceeding the benchmarks you’ve set. This makes it easier to see trends and wins now and later when you’re putting together your report. When tracking these items, you’ll also want to record which pieces of content are your high performers at each stage of the funnel or customer journey. This will give you the information you need to determine the types of content that move people from top to bottom. But to translate your performance into real business value, takes some work. Perhaps the best place to start is in conversions. How many MQLs and form fills has your content marketing generated? Are you filling the sales pipeline with qualified prospects? Once you have that number, you can use your sales team’s closure rate and average deal size to determine the potential revenue for each lead you generated. This gives your bosses a dollar amount they can easily understand and appreciate. The value of brand awareness and audience engagement is a little harder to determine as they don’t “directly” influence purchasing decisions. But if you have been tracking your customer journey and marketing funnel, you can show your CMO how that funnel is filling up and how content helps attract and move people from stage to stage. Below is an illustration of some of the metrics that you should consider highlighting at each stage and in the most business-tangible way possible. In addition, you can compare your social shares, likes, and mentions to that of your competitors. If you come out on top, this proves that your content marketing gives you greater visibility over your competition. If you follow the steps above, you’ll have no problem proving that content marketing is a valuable, revenue-driving tactic. For more ways to impress your CMO with real business results, use these content marketing measurement and ROI tips from brand marketing experts at Kraft and 3M.